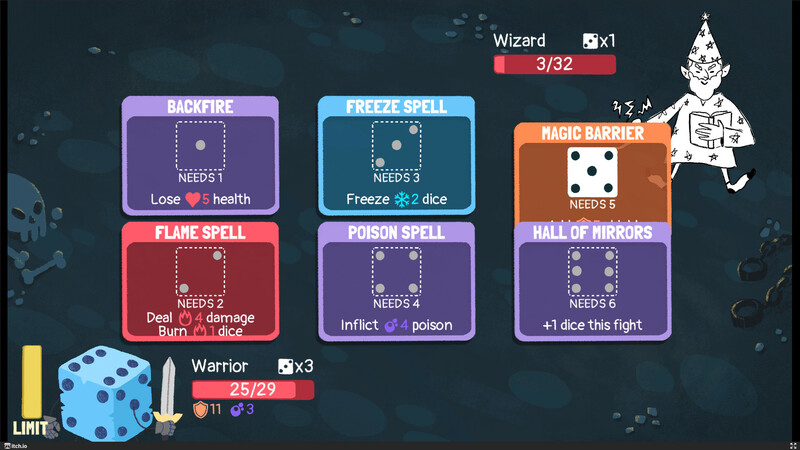 Dicey Dungeons is a new roguelike from Terry Cavanagh, Marlowe Dobbe, and Chipzel that seems quite simple, until you start getting further in and it becomes quite addictive. I've been silently following it for a while, as a fan of Cavanagh's previous games like Super Hexagon and VVVVVV I've been quite curious to see what it's like. Today, he put out a new build with fresh art from Marlowe Dobbe and music from Chipzel so it seemed like a good time to jump on in. What surprised me the most, is how deceptive the game is with its initial simplicity. You move around a really basic board, battling anyone you land on as you move. In terms of style and overall presentation, it's incredibly simple, but in terms of gameplay it's something else entirely. During a battle, you stick one of your dice in a slot of a card to use it. 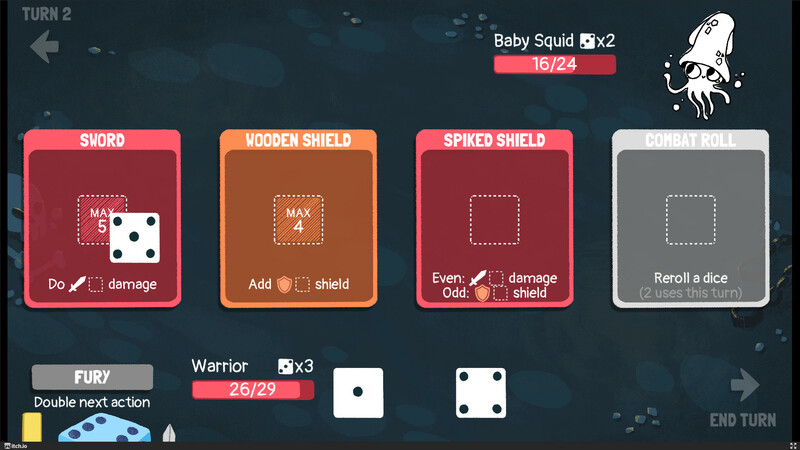 So if you have a sword that can do a max of 5 damage, you can stick a dice roll of 5 or anything lower inside and do your attack. As you progress, you collect more items from chests, shops and levelling up that you can plop some dice in and the game steadily brings in more mechanics and combinations. It actually feels a little like Slay the Spire in how it steadily crams more in. Some cards even take more than one die, some require a pair of matching dice and so on. At one point I came up against an enemy with fire damage, which literally set some of my dice on fire and to use them took away some health. There's plenty of fun situations like that, where the enemy is able to completely screw with you, which really does make it ridiculously engrossing. Each character also has a special ability. The Warrior for example, can re-roll a few times until you get what you want or you fail miserably and get left with rubbish. There's also the Inventor, who can use a special gadget like a jetpack to escape or a barricade to put up some armour. I could probably go on talking about the game for quite a while, considering all the little things it has going for it. What's also interesting about it, is that right now you can pick it up for $7.50 from itch.io and play it almost instantly, as it's a browser game. You can also try out older versions for free here, of course older versions don't really respresent the current picture, but they give you an idea of how it might play. Find it now on itch.io or follow on Steam for the release there. To be clear, it's not a finished game as it's currently classed as an alpha. Cavanagh confirmed that the Steam will release will also include a Linux build. If you love your roguelikes, do pick up a copy from itch as it's well worth it even now. I have it on in the background, as soon as I hit publish I'm having another run (it also helps that the soundtrack is pretty awesome). Reminds me a bit of Donsol, which does a dungeon crawl using a standard Poker deck. Although this seems to include a lot more tricks thanks to the format. Sounds like the sort of game I'd enjoy. Added to wishlist. For some reason, this put me in the mind of CardHunter. This looks great. Will pick it up on Itch, as I don't support those guys nearly enough.